← OK. Time for the Full Court Press. 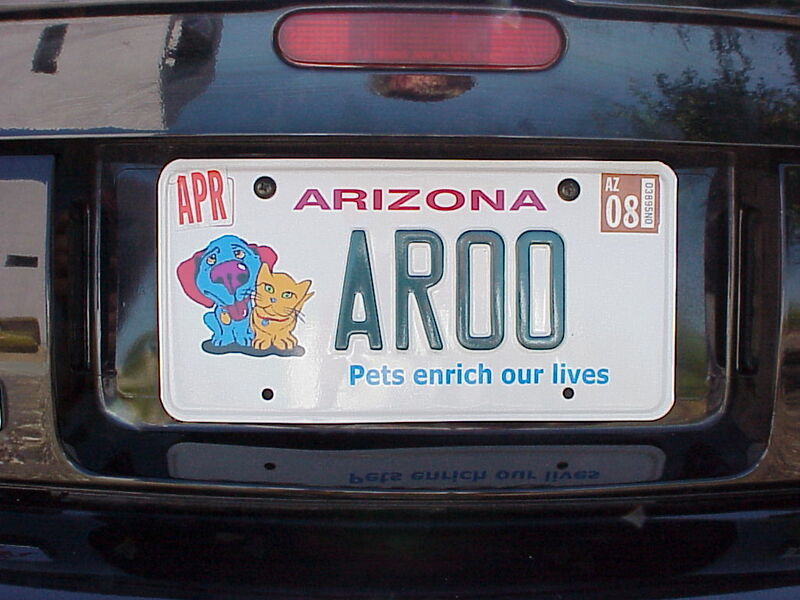 Do You Aroo Roo? And a VOTING UPDATE! This is what an "Arroo Roo" looks like. It’s what we do when we’re talking to you. (You understand what we say, don’t you?) Like I said, it’s a Scottie thing. I do it all the time. Lots of my friends do it, too. Now, I read somewhere that the state of Virginia has the most “personalized” license plates in the USA. But I must say THIS IS THE BEST LICENSE PLATE I’VE EVER SEEN! Now, I ask you, is that righteous or what? A SCOTTIEMOBILE????????? Whew. It’s just too much. Let me know what you say when you’re talking to your peeps. LADIES AND GENTLEMEN, time to pull out the stops! I’m in 2nd place in the “Cutest Pup” Photo Contest. 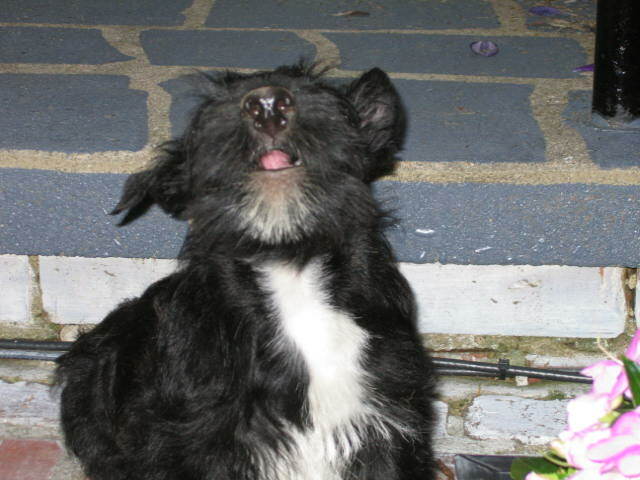 I promised I wouldn’t blog about this again, but I’m a Scottie. And headstrong. And stubborn. And I won’t take “no” for an answer. So, if you, or someone you know, hasn’t voted yet, here’s the link. My entry is titled: Blue Stuart. And, as much as I like ALL DOGS and ALL ANIMALS (except varmints – and you know who you are!) I cannot, in good conscience, let a dog in a superman costume win. Sorry Charlie. There. I’ve thrown down the gauntlet…. SCOTTIES AND TERRIERS AND FRIENDS UNITE!!!! NOW I’m in first place again. This suspense is killing me…..THANKS EVERYONE! 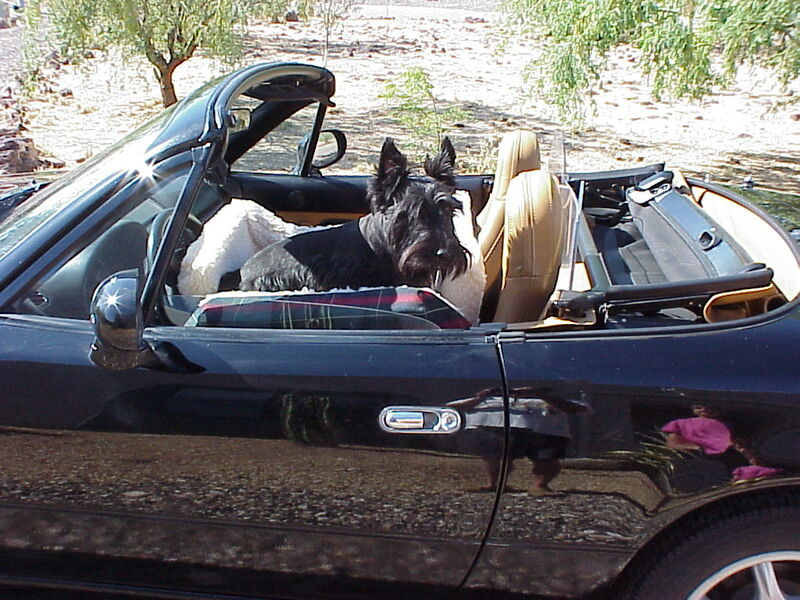 This entry was posted in Scottish Terriers and tagged Scottie Arrooo Rooos. Bookmark the permalink. 10 Responses to Do You Aroo Roo? And a VOTING UPDATE! We have our Sissy home and she has her friend Erin with her. Yesterday, Erin was awakened by the sound of our chorus – she was amazed at how loud we were – she had never heard the “Arrrooo Crew” before. We put the word out again – as of right now you are 2 votes behind that costumed dog – you were ahead when we first looked this morning – it looks like it’s going to be an exciting race!! Regardless of the outcome, we think you are the cutest dog in Virginia and are proud to call you our furiend. I’m a clacker, too, Duncan! Button doesn’t do the roo too often. But when she does we all laugh because it’s so out of the blue. And the scottiemobile with occupants is sweet (As grandson would say). We JUST LOVE IT!!!!! Your picture AND the number plate. Aroooooos to all you. I don’t get to see many Scotties here in Arizona-maybe a new one I didn’t know about every two or three years-this is “big” dog country. He knows someone He sees at work occasionally that has a Welsh Terrier-right here within 50 miles, and that counts. By the Way, I taught Kenzie how to aaaarrrrrrooooooooooooooooo. I pity the poor Westies, humans get them thinking that they’re cuter poodles-that’s why so many wind up in rescue (hey, I’m a rescue myself). Terriers and terrier peeps belong together. Give your peeps a little extra affection for me tonight. Well, we just visited the voting site again, and voted again, but the sad news is we got a message saying we’ve reached our max for this round of voting – but our one more vote DID count. We’re going to spread the news at work today (under the radar, of course!) and maybe we can help. On the aaaroo-rooing – one of us is VERY vocal about most everything, but especially when she wants to play with her ball and no one is paying attention. The other sister only aaroooos when there’s big excitement going on. We used to have a big sister named Bella who was part malamute and part shepherd and oh, boy! could she sing! Long and loud! We don’t do that, but we can aroo roo with the best of them! 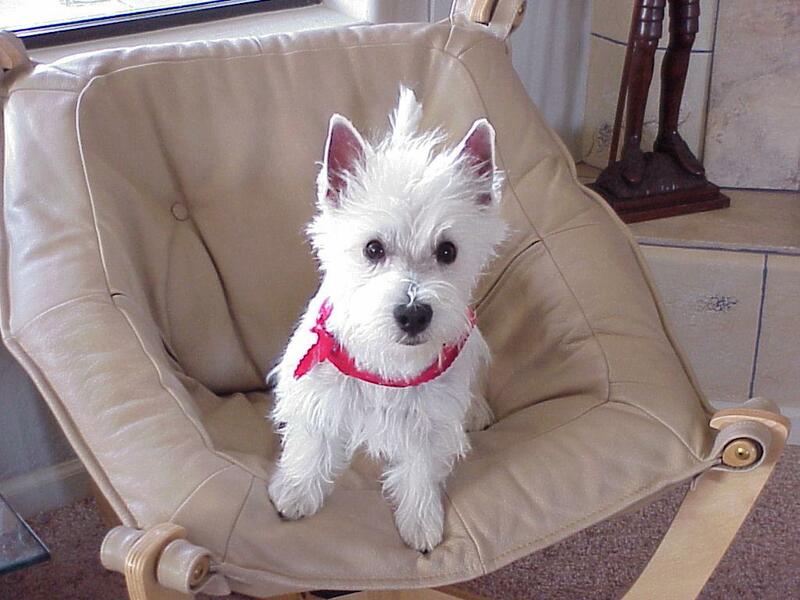 Good luck Stuart – and regardless of the end result, you ARE the cutest!! !